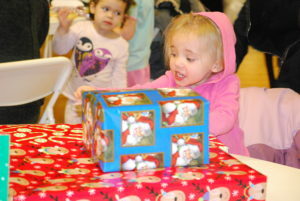 Lancaster, Pa. (December 13, 2018) – Each year, the children in YWCA Lancaster Child Care center celebrate the season during the winter solstice, complete with light refreshments, cookies and gifts for the children. This year, the twelve Standard Process Pennsylvania Distribution Center employees stepped up and purchased $1,500 in donated gifts for the children. They gave them to the kids by employees of Standard Process Inc. and YWCA Lancaster Child Care Staff during their celebration on Monday, December 17 from 5:30 – 6:30 p.m.
“We are especially grateful to Standard Process Inc. for raising the money needed to get these special gifts for the children,” says Cathy Lerch, director, early learning development, YWCA Lancaster. “The fact that they asked for the ages and sizes of our kids will make the gifts tailored specifically for them, which will make it even better for them,” she adds. The effort was supported by generous, personal donations and the Standard Process Cardinal Giving Program, an annual opportunity for employees to request and receive a charitable gift from the company for use in the community during the holidays. YWCA Lancaster early learning Enrichment Center provides activities through a hands-on, child-centered curriculum that supports individual intellectual, physical and emotional development. Staff help each child develop a positive self-image and the skills they need to succeed in their first years of school. Teachers are required to have formal education in Early Child Development, maintain 27 training hours annually, and be Pediatric First Aid and CPR certified. YWCA Lancaster Child Enrichment Center voluntarily participates in the Pennsylvania Keystone STARS quality initiative earning a rating of 4 STARS and partners with Lancaster-Lebanon IU13 for Early Head Start, and Pennsylvania Pre-K Counts.